What and Where Are Biological Soil Crusts? Although the soil surface may look like dirt to you, it is full of living organisms that are a vital part of desert ecosystems. This veneer of life is called a biological soil crust. These crusts are found throughout the world, from hot deserts to polar regions. Crusts generally cover all soil spaces not occupied by green plants. In many areas, they comprise over 70% of the living ground cover and are key in reducing erosion, increasing water retention, and increasing soil fertility. In most dry regions,these crusts are dominated by cyanobacteria (previously called blue-green algae), which are one of the oldest known life forms. Communities of soil crusts also include lichens, mosses, microfungi, bacteria, and green algae. These living organisms and their by-products create a continuous crust on the soil surface. The general color, surface appearance, and amount of coverage of these crusts vary depending on climate and disturbance patterns. 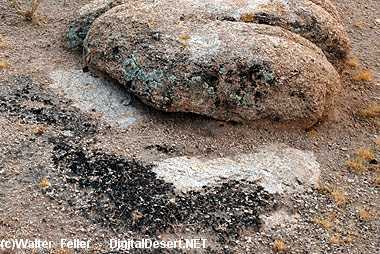 Immature crusts are generally flat and the color of the soil, which makes them difficult to distinguish from bare ground. Mature crusts, in contrast, are usually bumpy and dark-colored due to the presence of lichens, mosses, and high densities of cyanobacteria and other organisms. The organisms in crusts protect the soil from erosion in a variety of ways. Some organisms, such as cyanobacteria and microfungi, protect themselves from sharp sand grains by secreting sticky mucilage around their cells. These microbes move through the soil when moistened, leaving the mucilage behind as a trail. These mucilage trails glue soil particles in place. Mosses and lichens function a bit differently. They cover and protect the soil surface as the grow in place, but they also have small root-like anchoring structures that penetrate into the soil surface. The soil-binding action of crusts is not completely dependant on the process of living organisms. Layers of abandoned material, built up over longer periods of time, can still be found clinging tenaciously to soil particles at depths greater than four inches (10 cm) in some soils. Soil loss due to rainfall and water movement is increased when cyanobacterial connections are broken. This is particularly problematic when the impact is in a continuous strip, such as a vehicle or bicycle track, because channels for water flow are quickly formed, especially on slopes. Soil crusts are important in the absorption of rainfall. This function is especially important in areas that experience sporadic, heavy rainfall. When it rains, the organisms and their mucilage absorb up to 10 times their volume in water and then release the water slowly back into the soil when the rain ends. In cold areas, biologically crusted soils frost-heave in winter and create a roughened surface. The roughness slows rainwater runoff, which increases water infiltration into the soil. 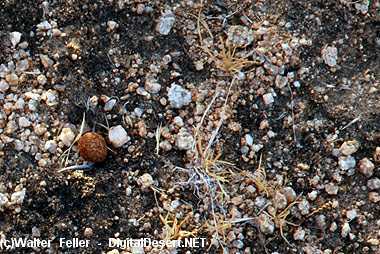 Crust organisms contribute nutrients and organic matter to desert soils. 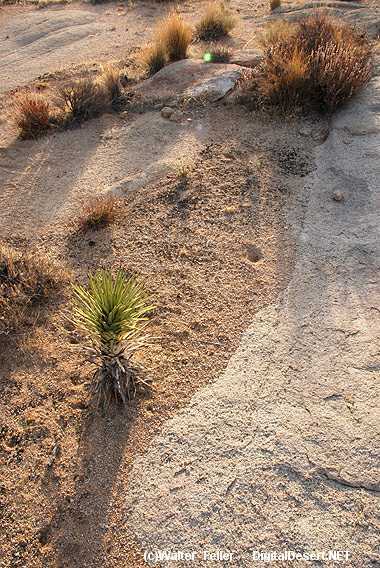 Because plant cover is sparce, crusts are an important source of organic material for desert soils. Organic matter is an important food source for organisms that live below the surface and who help keep nutrients available for plants by decomposing plant litter. Cyanobacteria and cyanolichens contribute nitrogen to soils, which is especially important in desert ecosystems where nitrogen often limit plant growth. Indirect benefits to soil health are also evident. Small soil particles often stick to trails of microbial mucilage. Soil nutrients bind to these small particles and are then available to plants. One additional benefit of crusts is that cyanobacteria secrete compounds that stimulate plant growth. Many human activities are harmful to biological crusts. 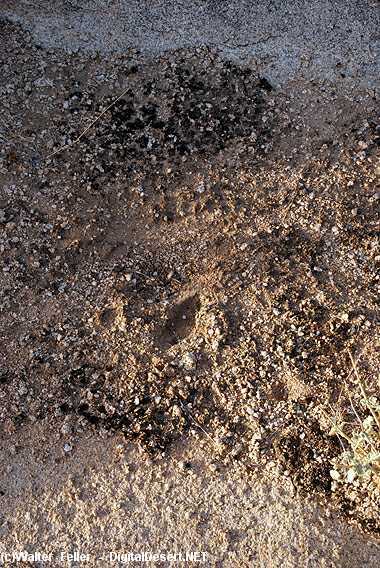 The crusts are no match for the compressional stress caused by the footprints of livestock and people or by the tires of vehicles. Because most living crust biomass is concentrated in the top 1/8th inch of the soil, even small impacts can have profound consequences. Crushed crusts contribute less nitrogen and organic material to the ecosystem and the soils are left highly susceptible to both wind and water erosion. Blowing sediment from disturbed areas can cover nearby healthy crusts. Burial can mean death because crustal organisms need sunlight to live. In addition sand, carried by wind sandblasts nearby crusts and plants, greatly increasing the erosive action of the wind. Windborne air pollutants from nearby urban areas and coal-fired power plants also damage the crusts. Even a single footprint has a long-lasting effect on desert ecosystems: nitrogen fixation stops, and underlying soil connections are broken. Damage done to material underneath the surface cannot be repaired because the living organisms are only on the surface. Under good conditions, a thin veneer of cyanobacteria may return in five years. Recovery may take up to 20 years in places of high rainfall and up to 250 years in places of lower rainfall, assuming an area is not again disturbed.